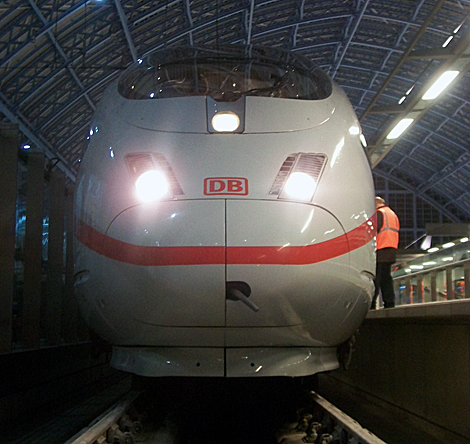 Deutsche Bahn today unveiled the premiere of its high speed ICE (InterCity Express) train at St Pancras and announced a planned service of three return journeys (morning, lunchtime and evening) between Frankfurt and London via Cologne, Brussels and Lille. The journey time from London to Cologne should take less than four hours and from London to Frankfurt just over five hours. Journeys from Amsterdam to London should be possible in less than four hours. The train unveiled at St Pancras today is an ICE3, though it will be a slightly different model – the new Class 407 – that will be operating on these services. Deutsche Bahn has ordered 15 of the trains which has a top speed of 320kph (200mph) from Siemens for a total of €500 million. The first trains will be delivered next year. Deutsche Bahn already offers ICE Connections in six European countries in cooperation with European partner rail companies: Austria, Switzerland, France, and Belgium. The Netherlands and Denmark with over 40,000 passengers each day using ICE or other high speed trains. Paul Chapman – Managing Director, of High Speed 1 which operates St Pancras station (see note below) said that there would be no problems of capacity at the station, even with Deutsche Bahn planning to carry one million passengers on the routes to and from St Pancras in its first full year of operation. “We already know there are no issues about accommodating a second operator into St Pancras and equally a third, should a third materialise. As a business we exist to sell capacity to people and we have spent the last 18 months working through issues from boarding, travel gates, and customer comfort. “We have six international platforms here, but in the peak hours we run between three and four trains per hour, so about 55 trains in each direction each day with Eurostar. The railway is built for far greater capacity than that. The full capacity is 20 trains per hour, so we can see demand increasing across Europe but we can’t see a point where we will run out of capacity. Chapman also said that Eurostar services would not be adversely affected by the introduction of Deutsche Bahn onto the high speed line. “The facilities have to be made equally available so we have done some work with Eurostar to remove some exclusivities to make sure Deutschebahn could be accommodated, but even with Deutsche Bahn running Eurostar will be our largest single customer and like any business you look after your existing customers – Eurostar and Southeastern while you try and grow new revenue. Chapman said that the train times for departures from London are governed for Eurostar by when trains can move through Paris, Brussels, or though the channel tunnel, and for Deutsche Bahn when the trains can fit into their German network. As to whether the station could handle the increase in passengers, Chapman said that when the station was opened in 2007 it had already been “Future-proofed”. “Our job is honing the operation, getting better at what we do, get a bit slicker, getting better signage. And doing what business travellers want. The quick gates for BusinessPremier and no doubt Deutsche Bahn will be looking at offering something similar as well. Travellers should expect the same if not better from Deutsche Bahn than they currently receive from Eurostar. “On a really busy bank holiday we might see 18,000 people in the day through St Pancras. We were moving 25 to 30 (thousand passengers) during the volcanic ash, so we already know we have the space and capacity to handle people providing we get operation right. That’s where teamwork is important, it can only really work if the two operators work together and we help set the rules for that process. When we introduced Southeasastern we moved from 19,000 train movements to 53,000 movements, and the station itself in the last year has gone from 700,000 visitors to nearly a million. Chapman said that the ability to process passengers quickly was both one of the attraction of using St Pancras and the reason it could expand its numbers. “One major advantage we have over airports is that we have 10-minute check-ins. We know that is hugely attractive to the business traveller. The reason we can handle 20,000 passengers in a day is because we don’t have a lot of dwell time “airside” [i.e. : after security]. Within 15 minutes of check-in you’re being called for your train. We don’t provide facilities for people to hang around because that’s not how we work the system. So will Deutsche Bahn be offered space airside to offer a business class lounge? For more information visit bahn.com, highspeed1.com, stpancras.com. Note: High Speed One (HS1) is the company that owns the assets of the Channel Tunnel Rail Link (CTRL), now called High Speed 1, the railway between St Pancras in London and the Channel Tunnel which connects with the international high speed routes between London and Paris, and London and Brussels.